Having diversity in the workplace brings together people with different capabilities, cultures and experiences,making your company a special place.Giving the message to your employees and your clients of your commitment to respecting and valuing them, makes you extraordinary. Be extraordinary! Lists Holy Days AND Cultural Festivals for each faith with explanations. Important religious days are highlighted for employees' work schedules. Each event is colour-coded to indicate a Schedule Alert day, cultural event and/or religious day. One-page Summary Table of Religious days for quick crossreference. Index to reference religions, holidays and countries for easy cross-referencing. 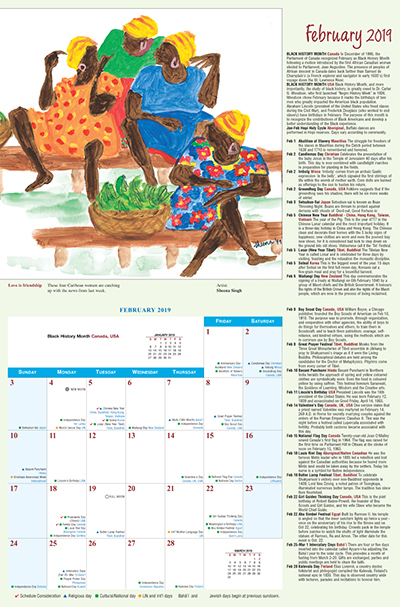 12 x 9 wall calendar with 12 original ethnic artworks. Support your Company's message of diversity all year round! Get your logo printed on the calendar. Three options available. Dimensions of a closed calendar 12.75" by 9.75"
Logos printed free for orders over 1000. Under 1000, the cost is $350.